The feud between Caitlyn Jenner and her ex-wife Kris Jenner may be at a cease-fire at the moment, but it is just getting started. The Keeping Up With The Kardashians matriarch made her life a living hell, especially in the days leading up to the big transition. 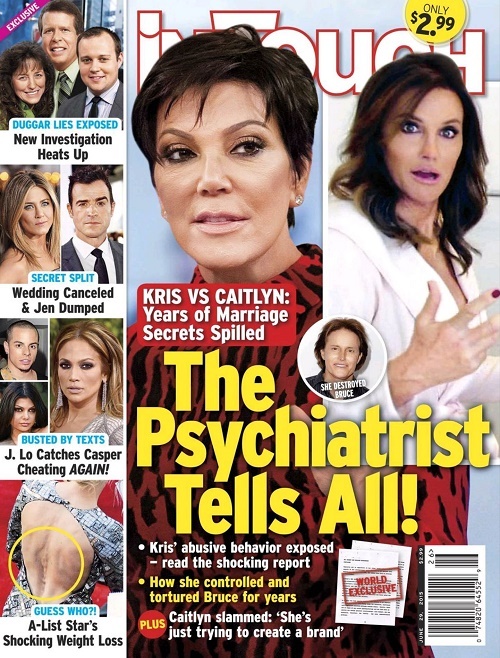 And, before Caitlyn made her debut, Kris even mocked her transition and stated in interviews that it was “silly.” But, according to psychiatrist report that was leaked by In Touch Magazine, Kris Jenner is officially a narcissist and she will never stop resenting Caitlyn for betraying her by becoming a woman – and will stop at nothing to get revenge. Kris Jenner insists that she had no idea Bruce was unhappy in their marriage and wanted to become a woman, but according to In Touch’s shocking report that is not the cast at all. According to one of In Touch Magazine’s insiders, Kris Jenner chose to be in denial and ignore the obvious – because she simply didn’t like them and had no disregard for others. The insider dished, “She ignored that Bruce had breasts when they first started seeing each other. Kris Jenner may be laying low because of all the backlash she has received after it was revealed that she tormented Caitlyn over her transition, and forced her to be Bruce for years. But she is far from done making Caitlyn pay for the embarrassment that Kris thinks she has brought on her. And the fact that Caitlyn is stealing the Kardashian’s fire is only adding fuel to the fire. Caitlyn’s reality TV show is set to premiere in July 2015 on E!, and ratings are expected to blow Keeping Up With The Kardashians out of the water, which will also infuriate Caitlyn’s ex to no end. The more success Caitlyn Jenner receives, the more vengeful narcissistic Kris Jenner will become, the feud is just getting started! Caitlyn Jenner, Kris Jenner Feud: Caitlyn Ridicules Kris With Tweet, Throws Subtle Shade On Momager? Bruce and Kris Jenner Divorce Official: Bruce Tired Of Being Made A Fool Of On Keeping Up With The Kardashians! Kris Jenner Dating Corey Gamble, Music Industry Executive With Justin Bieber Ties – True Romance Or Business Move? Kim Kardashian Divorce: Kanye West’s Craziness Keeps Her Relevant, Ignores Kris Jenner, Won’t Break Up?